If you are Smart TV users, you may be familiar with Spotify streaming on Smart TV. There is no differences about Samsung TV. As you know that Smart TV users can use the built-in Spotify Music App to enjoy Spotify music songs or playlists. Like others, if you are Spotify Premium subscribers, you can listen to ad-free music on Spotify, or you are Spotify Free users, you can only play Spotify music files with Ad. There is no need to subscribe Spotify Premium month by month, only you get one third-party tool – Spotify Audio Converter Platinum, and then you can get the whole downloaded and Ad-free Spotify music songs. If you want to one button to download your Spotify audio files, this program can help you. If you want to remove DRM limitations from Spotify and then play them on MP3, Sony PSP, iRiver, Creative Zen, iPod Nano and other audio player devices, it can help you. If you want to share Spotify playlist with your friends or share them with your family, it supports you one button to share with others. If you want to burn Spotify to CD, it also supports you one button solution. 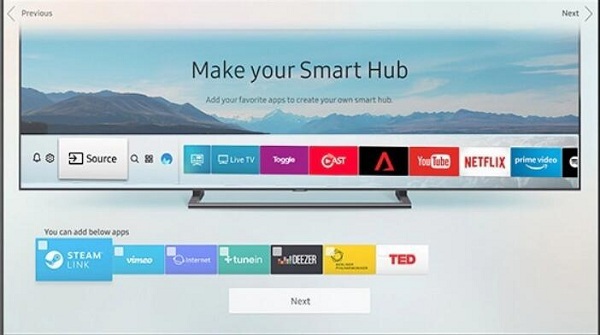 A smart TV is a traditional television set with integrated Internet and interactive "Web 2.0" features which allows users to stream music and videos, browse the internet, and view photos. Just follow the guide to convert Spotify music files, and users can enjoy Ad-free Spotify music on Samsung Smart TV even with Spotify Free account. Before the conversion, free download the latest version of Spotify Audio Converter Platinum, install and run it. Step 1. Load Music from Spotify. Click "Add button" icon and then drag and drop some one music song or the entire playlist from Spotify to the Spotify Audio Converter. If you don't want to convert the entire playlist, just choose the music files you want to convert and click "Ok" to add them to the file list. There are totally four output formats including MP3, AAC, FLAC and WAV with up to 320kbps for users to choose. You can also save the output audio into Artist, Album, Artist / Album or Album / Artist folder as you like. When you have done all the above settings, now click the "Convert" button to start conversion. After conversion, you can click History Button to easily find the converted files. Connect USB to your computer and transfer them to the USB driver. After this, you can play Spotify Music files on Samsung TV or any other TVs with the help of USB.